Next Gen Dine iPad point of sale by Prelag Partners LLC is now fully installed and operating at several restaurants in Downtown Las Vegas. Next Gen Dine provides these hip and trendy restaurants with a unique new way of doing dining. 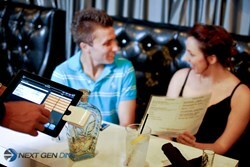 Next Gen Dine is a cloud restaurant point of sale that offers restaurants more than just the traditional POS services. The NGD POS service gives the DTLV restaurant servers the ability to take orders anywhere in the establishment, which allows for table-side orders and payments. The orders placed on NGD POS are immediately sent to the kitchen to be prepared, thus reducing the order turnaround time. Less waiting time for customers creates a better dining experience. Next Gen Dine makes it fast and easy for online ordering and is the future of restaurant dining. For more information about the product or to find out how your restaurant can take part of Next Gen Dine, contact Paul Roberts at 1-877-342-2218 or paul(at)nextgendine(dot)com.